Over the last few years Motorisation of Blinds & curtains has moved very fast we have gone from simple Chain or pull cords operation of blinds and curtains. Blinds have moved a little slower than the curtain rails, however, electrically motorised Curtain tracks have always been high-end contract work. 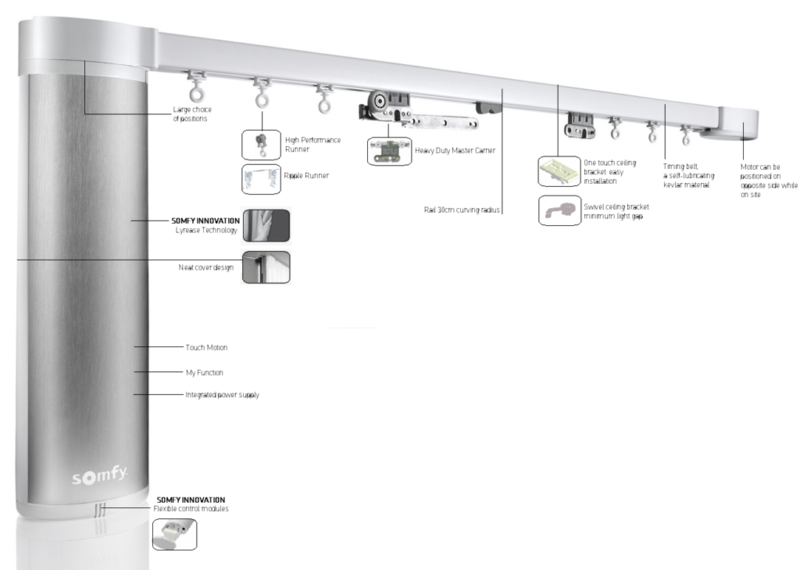 Somfy a leading manufacturer in blind motorisation has manufactured Motorised Curtain tracks for a number of years but pricing was prohibitively high. Home Automation is now becoming so popular it’s not just motorised blinds that the discerning client is looking for its complete package of Blinds, Curtains, Awnings, Gates, Security Alarms, Garage Doors and the list goes on. Somfy introduced the “Tahoma Premium” Smart Hub last year and in conjunction with Free “app” everything is now possible in fact most weeks we find something else that can be connected wireless. Using The Tahoma Premium allows you to connect and control your Blinds, Curtain Tracks etc from your Smartphone, IPad, a computer and if you want to connect voice commands Amazons “Alexa” what a labour saving device. If you are not in a position where mains power is available many products can be motorised using rechargeable battery options, all our blinds and curtains tracks can use this option.